There is no better way to enjoy the festive Christmas holiday celebrations with our respective pooches than to dress them up in their best getup or even to keep them warm especially on those chilly nights of the winter season. We have always been known for making our dogs as extensions of ourselves, giving them items that we personally love and use. 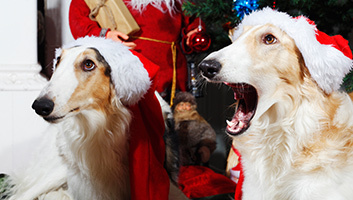 So while everyone is gathered around the Christmas tree trying to open up their presents, our pet canines can also join in the fun with these 10 best dog Christmas outfits. And if in case you have a visitor dropping over or a guest for the holidays, we’re pretty sure these costumes will literally be the star of the show. If not, they can always wear some of these as part of their everyday winter clothing. What’s Christmas if you don’t have Santa in the house even if that means he is walking on all fours? This dog costume from NACOCO can really usher in the merry and festive mood of Christmas with its excellent attention to detail, albeit in a miniaturized form. 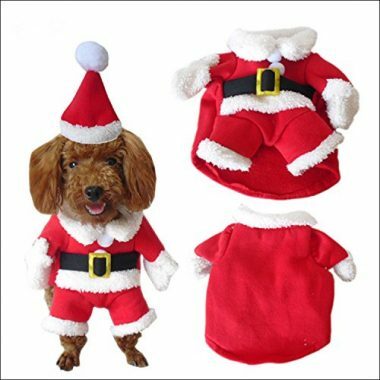 The fabric materials used in the fabrication of such dog Christmas outfits are only of the highest quality, ensuring optimum comfort for your pooch while it is parading around the house in this adorable dog Santa costume. Now, if you could get Rudolph to start pulling the sled, your Santa dog should be more than ready to spread good cheers to everyone in the house. 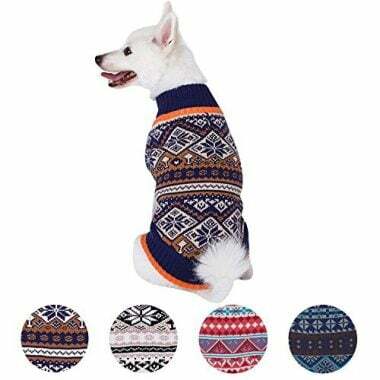 The 4 Pattern Holiday Season dog Christmas Outfits from Blueberry Pet is a remarkable sweater that can actually be worn by your pooch any time of the year especially if you live in colder regions. 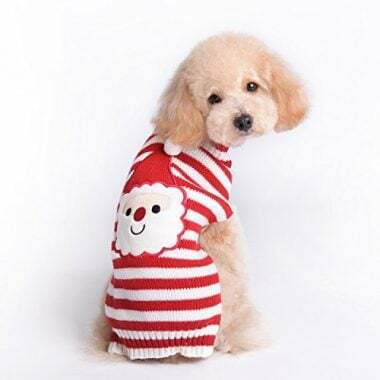 This dog Christmas sweater is sure not only to keep your dog warm and comfy, it is going to draw the attention of your guests, too, who will find their memory cards getting filled with snapshots with your adorable canine friend. Made of durable and shrink proof fabric material that helps make it super easy to clean, this Blueberry Pet creation is just perfect when it comes to providing exceptional warmth and comfort to your hound. Another lovely dog Christmas sweater that you can put on your pooch is this Festive Christmas-themed sweater design from Blueberry Pet. Reindeers adorn the central panel of the Blueberry, an iconic character that is almost always a mainstay of holiday celebrations. The various patterns are reminiscent of classic holiday celebrations in the village, subtle yet very meaningful. The collar and hems are somewhat elastic to allow for a more comfortable fit. It is machine washable and can be tumble-dried, too. This is a lot more convenient than having to wash it by hand. 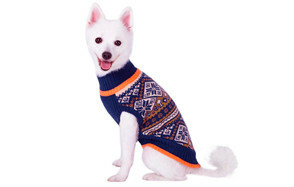 Overall, this Blueberry Pet dog sweater is a great all-year round outfit. 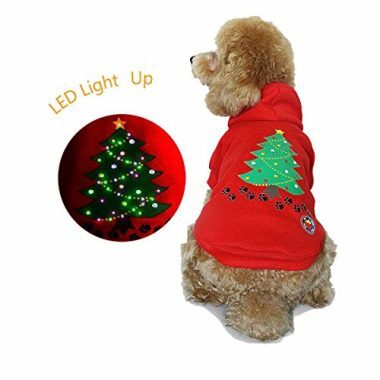 If you want your dog to get the attention of everyone in the room even though it is dark, then the RoyalWise Light Up Dog Shirt Costume is the one to get. This pet costume dutifully integrates several multi-colored LED bulbs into the overall design of the shirt. 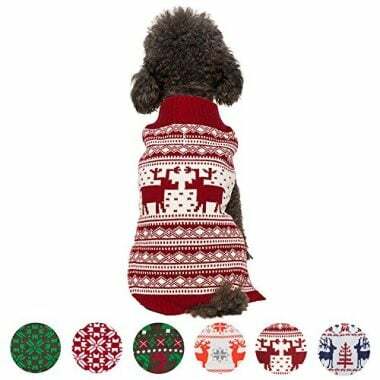 This provides the dog Christmas sweater a certain personality that is sure to be the talk of the town as your family ushers in the New Year. Control of the LED lights is achieved via a mechanism that’s built into the hood, allowing you to provide a dazzling interplay of fading and flashing lights. The RoyalWise also comes with a hole at the neck area to allow for the insertion of a leash, giving you control of your hound while it is walking in this light-up show. Penguins are not necessarily characters you’d associate with Christmas as they’re more related to colder, icier environments. Perhaps it’s an allusion to the land of Santa where it is mostly covered in snow? No one knows. Regardless, this Fitwarm dog clothes that come with a lovable mixture of penguin and snowflake patterns on a red background and green hems is one amazing outfit for your hound this Christmas. 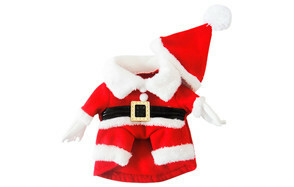 These Fitwarm dog Christmas outfits feature long sleeves to keep even the limbs of your pooch relatively warm. The fabric is exceptionally soft, too. Sometimes you really don’t need a full-body costume for your pooch to convey the message of the holiday season. Take for example this Elf Hat with Bell from reputable costume-maker Rubie’s. It is a very simple red conical elf hat with green trim and a golden bell at the tip. It also comes with a red collar in the iconic petal arrangement with green pompoms adorning the tips. The design of these large dog costumes will never interfere with your pooch’s optimum movement. The only downside is that, since it is specifically a specialty costume, your dog will not really be able to use it on a daily basis. Regardless, we can guarantee guests will have plenty of fun taking snapshots with your fury little 4-legged elf. This dog Christmas sweater from Moolecole features a lovable reindeer face emblazoned on the knitted fabric. We can only guess that this is the company’s interpretation of what Rudolph looks like since they managed to turn its nose red and shaped as a heart which, we believe, epitomizes the real essence of the holiday season. The knit itself is made of a blend of fabric materials giving it exceptional strength. The same fabrication gives the Moolecole amazing shrink-proof capabilities so you can easily toss it in your washing machine, although we personally would recommend washing it by hand. The slightly elastic nature of the sweater makes it super easy to slip over your pooch’s body. The Moolecole makes for a great every day wear for your dog. 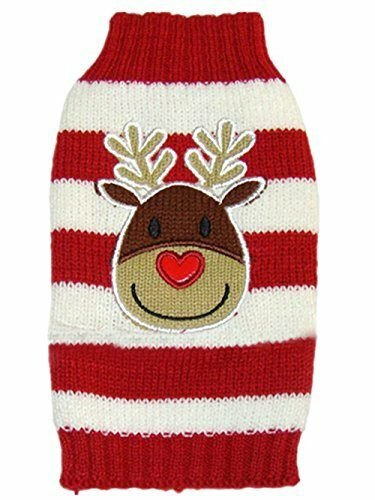 These dog Christmas outfits from HAPEE are pretty much similar to the Moolecole creation in that they are also knitted, giving your pooch exceptional warmth during the chilly nights of the holidays. The only difference from the Moolecole is that the HAPEE features the gleeful face of Santa in a rather whimsical way, with its overflowing beard, wide bright eyes, and a really wonderful smile. We’re pretty sure your dog will feel the spirit of the holidays every time it wears this Santa Dog Sweater. The fabric is slightly elastic to allow for a more comfortable fit. 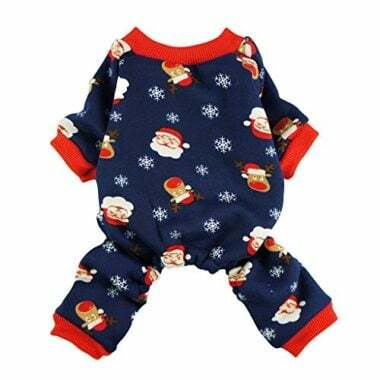 The Fitwarm Cute Santa Reindeer Pet Clothes Christmas Dog Pajamas are essentially the same with the Fitwarm Cute Penguin Xmas Pet Clothes Pajamas for Dogs, with the only difference being the printed design. It comes with the same 4-leg sleeves for optimum warmth. We’re not really sure about its daily use, however, since its design is inherently associated with the Christmas holidays. However, this doesn’t seem to stop other dog owners from making it an everyday canine wear. Maybe you should, too, especially if you live in colder regions. There’s a new member to Santa’s elf workforce and it’s walking on 4 legs. 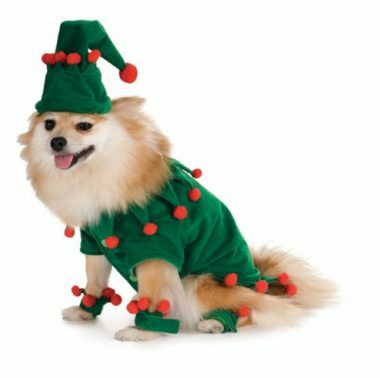 Get ready to have your pooch be the star of the show this holiday season with this Elf Pet Costume from Rubie’s. It’s a full body dog costume that comes in a green tunic plus the iconic elf fat. It also comes with green ankle cuffs, all of which are adorned with red pompoms. The material is made of polyester and requires washing by hand perhaps because of the presence of the pompoms. While the elf costume is largely associated with Christmas, we do think it can also be used for other special occasions. Picking an outfit for your pooch to wear this Christmas holiday season should be relatively easy. But, in case you’re having difficulty on where and how to start you can always rely on our dog Christmas outfits buying guide to point you in the right direction. Before making that purchase, you need to look at these three parameters since these are crucial whenever you’re buying a doggie outfit. Like any other wardrobe, getting the correct size is very important. This will help you identify the most appropriate clothing for your pooch. We’ll have a more detailed presentation of this in the succeeding section. When we talk about comfort we’re essentially talking about the materials used in the fabrication of the doggie outfit. Many of today’s doggie wardrobes come in different fabrics, but mostly polyester since this material provides exceptional smoothness and durability. You will also have to consider the weight of the costume. Heavy ones will simply be uncomfortable to wear. The safety of a dog costume is an important consideration. There are quite a few safety hazards related to doggie costumes that we’ll be dealing with in the succeeding sections. Deciding on the right Christmas outfit for your dog requires an understanding of a few basic things. Of course, these are just general guidelines that you can somehow modify to suit your dog’s needs. The important thing to remember is to choose an outfit that is right for the season, safe, and will not in any way restrict or impair their movement. Here is how you can pick the right Christmas outfit for your pooch. Of all the considerations you need to carefully evaluate, size ranks tops when it comes to the right outfit. A costume may look absolutely stunning and elegant, but if it simply doesn’t fit right, then it will still look ridiculous on your dog. For instance, if it is too baggy and loose, your hound will look more like an emaciated pooch. If the outfit is too tight, there will be some health and safety implications, not to mention risking your pooch appearing too fat or obese. As such, it is always imperative to take the most accurate measurements of your dog. This is not really difficult. You only need a cloth tape measure and a good understanding of how to take length and circumference measurements and you’re good. The reason why a cloth tape measure is preferred is that it allows the device to conform seamlessly to the shape of your pooch’s body. Whatever you do, don’t use a steel tape measure. As long as it is flexible, then it should be fine. There are two very important measurements you need to take. The first is your dog’s body length. Get the tip of your tape measure and place this at the region slightly above the area where its neck meets the shoulder bones. This is the base of its neck. Now run the tape measure towards its tail and terminate at the region where your dog’s back meets the base of the tail. This is the length of your pooch’s body and the measurement can be a basis for the length of the outfit that you want to take for your pet. Many dog owners prefer the length of their canine clothes to be several inches short of the base of the tail while some would go the entire length. The second measurement you need to take is your dog’s chest circumference, also known as its girth. This is quite easy to measure. Just look at your dog from the side and take note of the widest section of its chest. This can usually be seen just behind its front legs forming an inverted hump towards its belly. Wrap your tape measure around this widest part of its chest and take the measurement. Make sure to leave about one or two fingerbreadths in your measurement so that it will not be tight. This will also allow your pooch exceptional movement. There is another measurement that you may want to take although this is completely optional. The collar size is often taken if you are going to purchase an outfit that includes a collar such as a sweater and the like. To measure this, you need to locate the base of your dog’s neck. You can try moving your hands along the back of its neck and locate that part where it meets its back, usually located just a few inches above its shoulders. Just like measuring its chest circumference, you can wrap the tape measure around the base of your dog’s neck to determine the collar size. Again, leave a finger or two fingerbreadths in your measurement as an allowance so the clothing will not constrict your pooch’s neck. While it is the holiday season, you may want to look at a design that your pooch can also wear on a daily basis or perhaps even on special occasions. You clearly don’t want to purchase something that your dog will only be using for a day or even a few days every year. One problem with some pet costume manufacturer is that they’re more focused on the style of their creations and not necessarily on the comfort of the pooch that is going to wear it. Unless you expect your pet dog to be just sitting in a corner while everyone is having fun, then getting an outfit that will not restrict their movement is an absolute must. That is why you also have to check the overall construction of the outfit especially at the joints. Make sure the design will not impair your dog’s ability to move. Be careful about doggie garments that come with small removable objects or items that can be easily removed by your dog. Just as a dog’s comfort level is important, so is its safety. Having a doggie outfit that comes with removable elements may increase the risk of choking in dogs. One of the most important considerations when buying items or products for your pet dog is safety. You might think that a dog’s outfit is generally safe. Unfortunately, there have been incidents in the past where a particular dog got injured because of such costumes. As such, it is imperative to observe these tips for safe pet costumes. The very first thing you can do to ensure your pet’s safety is by training them to love their outfit. This is crucial since some dogs are known to be not really fond of having fabric on their bodies. It takes getting used to, actually. So, be patient in teaching your hound to accept the costume as a normal part of its being. You don’t want it fighting with its wardrobe, shredding it in pieces, and risking injury. There are quite a number of doggie costumes that come with very small components. These can be considered safe insofar as they don’t get detached from the costume. Unfortunately, knowing that some dogs are very tenacious when it comes to certain things they can chew on, they can easily remove these attachments and risk choking on them. Even if your dog is not known for destructive behavior – chewing on things – it is still better to err on the side of canine safety than be sorry afterwards. Most of the doggie incidents related to pet costumes occurred while the human master was not looking. While we are not necessarily saying that you need to fix your eyes on your pooch every time they are wearing a costume, what is critical is that you have active supervision over their use. This is especially a concern among pooches that are rambunctious or are simply very active. So, make sure to supervise them whenever they’re on their costume. Experts don’t generally recommend costumes to puppies and elderly dogs. Puppies are small and are quite rambunctious with their behavior more on the raw side. They are still in the process of learning the ropes of canine behavior and obedience training such that they may not fully understand yet what you are telling them not to do. Elderly pooches, on the other hand, typically have a host of musculoskeletal and cardiovascular problems that may be exacerbated by the wearing of costumes, not to mention sensoriperceptual problems. A senior dog with osteoarthritis may already be in pain because of the inflammatory joint process. Letting it wear constricting clothing may make the symptoms a lot worse. Sure your dog is strong as it is muscular. However, this doesn’t give you the right to burden it with additional weight. This is especially true for costumes that come with headpieces. These costumes should not be too heavy so as to cause discomfort to your pooch. The idea about costumes for the holidays is for your dog to have fun. If you give it something that is heavy, then it is not fun at all. This can hamper with its ability to move or even its focus and concentration. Lack of focus is one of the key ingredients to accidents. We have already discussed above how limiting your pooch’s movement is not a good idea. Dogs will always be on the go, whether it is running across the room or walking casually from room to room entertaining your guests. Now imagine if it has a costume that limits the range of motion of its joints, then movement will be rather challenging. Rather than walk, your pooch will be confined to a corner in your house while everyone else is having a great time. How cruel is that? Worse, your dog might take matters into its paws and shred the costume altogether because it firmly believes that the costume is getting in the way of its freedom. So, be careful when choosing the right size of costume for your pet. Dogs cannot verbalize their complaints. They cannot tell you that the costume is making it difficult for them to breathe or move. They cannot complain that the outfit is way too heavy for comfort or that they don’t like the design. Well, they may not complain to you verbally but they can surely show you their anxiety, frustration, and even disgust with the costume that you made them wear. It is therefore, very important that you brush up on your knowledge of what canine behavior will constitute a ‘complaint’ or that something is amiss. Generally, these can include but not limited to whining, scratching, restlessness, barking, and even staying inside its dog crate or den. It is always fun to see our pet hounds wear the costumes or outfits we bought for them. By making sure that we get the correct size, provide the best comfort, and ensure their safety, we know that our pooches will love us for what we have done for them. Of course, we also need to train them to learn to love their outfits and to always supervise them while they are wearing these garments. Safety is such an important aspect even in pet clothing. With these best dog Christmas outfits, you can be sure that the materials used in the fabrication are all safe, provide exceptional comfort, and elicit tons of praises from your holiday guests.